To make the butter use a spatula, stir rosemary, thyme and salt into butter. Place butter into plastic wrap, and use the wrap to shape butter into a log. Let chill for at least two hours (I made this a day ahead). with rosemary, thyme, salt and pepper. Rub seasonings into both sides of the chops. Put a large skillet over medium high heat on the stove top. Pour in remaining two tablespoons of olive oil, rosemary sprig and the smashed garlic cloves. Cook, stirring until garlic is fragrant but not browned, about 2 minutes. Discard rosemary and garlic, and increase heat to high. Add the veal chops to the pan, and cook for 2 minutes on each side. Reduce heat to medium high and continue cooking, about 3 to 4 minutes on each side. 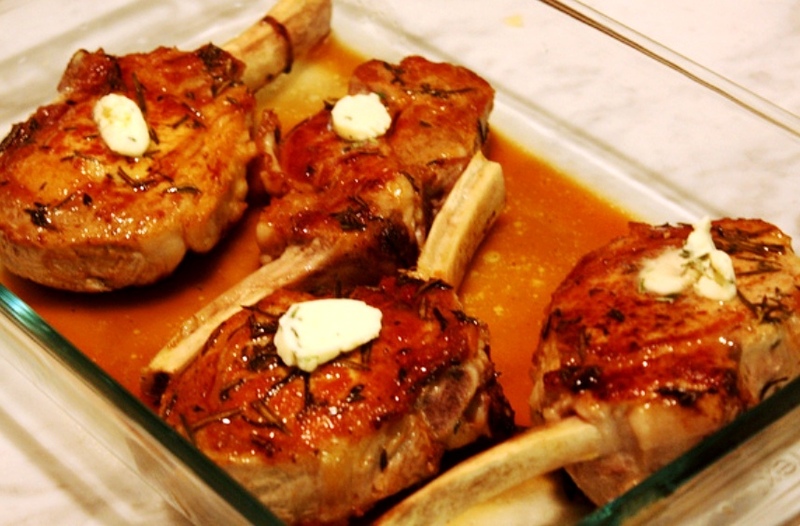 Transfer veal chops to a baking dish and loosely cover with foil. Pour out fat that remains in skillet and reduce heat to medium. Add wine, stirring up brown bits on the bottom. Simmer, cooking until about 1 to 2 tablespoons of wine remains. Remove from heat and drizzle liquid over veal chops in the baking dish. Serve, with a pat of rosemary butter on top. Enjoy!